Amazon.com Price: $18.77 (as of 02/04/2019 14:00 PST- Details)	& FREE Shipping. 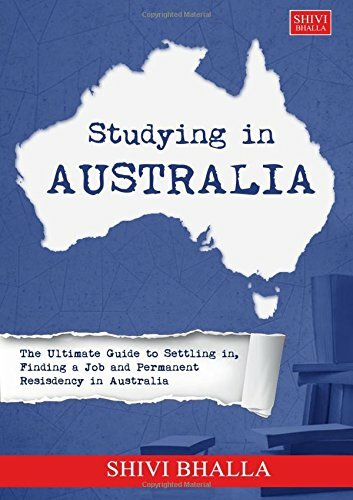 This book “Studying in Australia”- The ultimate guide to settling in, finding a job and permanent residency in Australia is just for you! You’ll discover 9 winning strategies to create a new, rich life in Australia… including… 1. The essential mindset for success 2. Secrets to gaining your dream job 3. Tips for Permanent Residency Every strategy is an eye opener and a door opener too! Packed with knowledge and bursting with insights and anecdotes, this book will hold your hand, show you the way and when needed, shake you up to help you re-focus on your goals and dreams in Australia. Australia is among the world’s most preferred destinations for international students and skilled professionals. It also has its own unique challenges and characteristics. 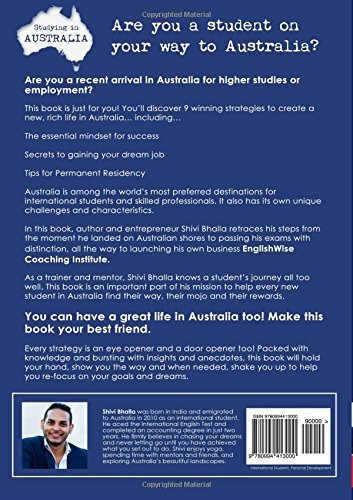 In this book, author and entrepreneur Shivi Bhalla retraces his steps from the moment he landed on Australian shores to passing his exams with distinction, all the way to launching his own business EnglishWise Coaching Institute. As a trainer and mentor, Shivi Bhalla knows a student’s journey all too well. This book is an important part of his mission to help every new student in Australia find their way, their mojo and their rewards. You can have a great life in Australia too! Make this book your best friend.